He was the Sultan of Swat. The Caliph of Clout. The Wizard of Whack. The Bambino. And simply, to his teammates, the Big Bam. From the award-winning author of the New York Times bestseller Ted Williams comes the thoroughly original, definitively ambitious, and exhilaratingly colorful biography of the largest legend ever to loom in baseball—and in the history of organized sports. 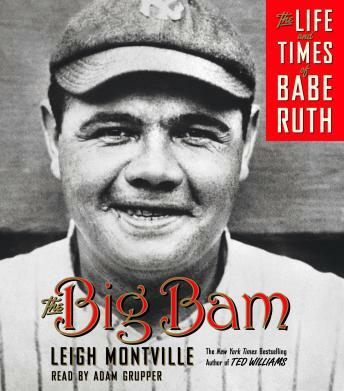 Based on newly discovered documents and interviews—including pages from Ruth’s personal scrapbooks —The Big Bam traces Ruth’s life from his bleak childhood in Baltimore to his brash entrance into professional baseball, from Boston to New York and into the record books as the world’s most explosive slugger and cultural luminary. Montville explores every aspect of the man, paying particular attention to the myths that have always surrounded him. Did he really hit the “called shot” homer in the 1932 World Series? Were his home runs really “the farthest balls ever hit” in countless ballparks around the country? Was he really part black—making him the first African American professional baseball superstar? And was Ruth the high-octane, womanizing, heavy-drinking “fatso” of legend . . . or just a boyish, rudderless quasi-orphan who did, in fact, take his training and personal conditioning quite seriously?